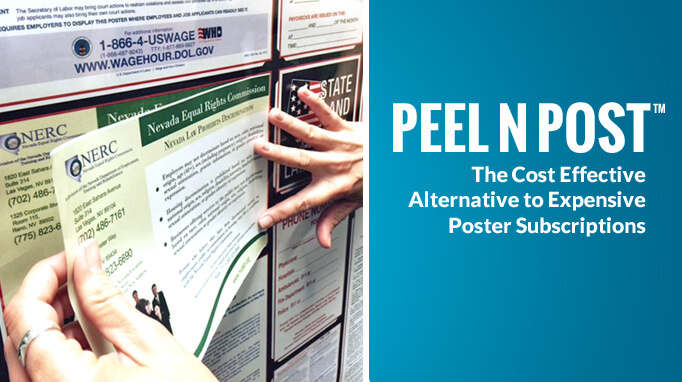 Peel 'N Post Labor Law Poster Compliance Updates - Only $9.95! Are subscription services costing you too much? Tired of replacing a full poster every time a single labor law notice changes? Are paper replacement notices difficult to keep up to date? Do they look messy? Peel ‘N Post™ update stickers are the easy and cost effective alternative to expensive poster subscriptions. When a single state or federal mandatory posting changes, we create a Peel ‘N Post sticker of that posting. Simply purchase the Peel ‘N Post sticker and apply it to your existing All-On-One™ Labor Law Poster or Mobile Poster Pak™ (“MPP”) to bring your All-On-One Labor Law Poster or MPP up to date. The best news is that Peel ‘N Post stickers cost just $9.95. If you have multiple locations, your company can easily SAVE thousands of dollars each year by using our exclusive Peel ‘N Post update stickers instead of paying for the replacement of an entire poster or paying for a subscription service. Peel ‘N Post update stickers are much more cost effective than expensive and wasteful subscription services. With subscription services, you pay an annual premium for a full poster replacement every time a single posting changes. You pay the annual premium even when there are no posting changes during the year. Our Peel ‘N Post update stickers are low-cost, pay-as-you-go alternative. Whenever a mandatory posting change occurs, we will automatically notify you of the Peel ‘N Post update by email and give you a follow-up call to ensure you stay current with Peel ‘N Post updates. Or, you can simply order the Peel ‘N Post online. It’s that easy – and best of all, if there are no posting changes, you won’t have to spend a dime! Peel ‘N Post update stickers are dated for the year they were created. The Peel ‘N Post sticker remains valid until it is superseded by a newer version of the posting. When there is a newer version of a posting you are required to have, we create a new Peel ‘N Post sticker and discontinue the old Peel ‘N Post sticker. Of course, we update our All-On-One Posters every time a posting changes, no matter how small. However, you need a full All-On-One Poster replacement only when there are multiple mandatory posting changes at the same time or a brand new posting is introduced. When there a multiple changes, a full All-On-One Poster replacement becomes the more economical option. If a Peel ‘N Post is not available for your state, it means that there were multiple posting changes the last time your state issued postings and a full All-On-One Poster update was necessary. Check the product page for your state All-On-One Labor Law Poster for information on recent changes, or speak to a compliance advisor if you have any questions about changes in the law or our poster changes. In addition to saving you money, Peel ‘N Post update stickers are easy to apply. Simply peel the backing off a sticker, line it up with the corresponding posting, and then press to adhere to your poster. With the Peel ‘N Post sticker in place you are in full compliance with the state or federal notice posting law or regulation. Peel ‘N Post updates offer an environmentally friendly solution to poster compliance because they require significantly less paper, lamination, ink, packaging and shipping costs when compared to replacing an entire poster. Join companies like IBM, Shell Oil U.S.A., RICOH, Ralph Lauren, Bank of the West, and thousands more who have made the change to Peel ‘N Post updates.